Hollybeary Creations : Newton's Nook July Release Day 3!! 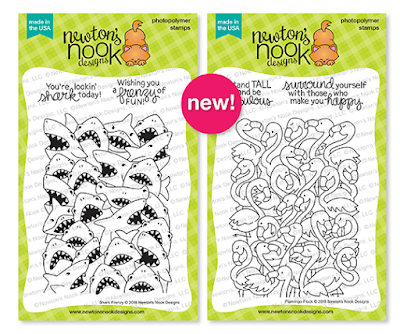 It's Day 3 of the Newton's Nook Designs July Release celebration and today we have two new sets featuring Sharks and Flamingos!!! These sets are similar to the previously released Woof Pack, Company of Cats and Frozen Fellowship. So if you liked these sets Shark Frenzy and Flamingo Flock are must-haves for your collection! My first card features Shark Frenzy... 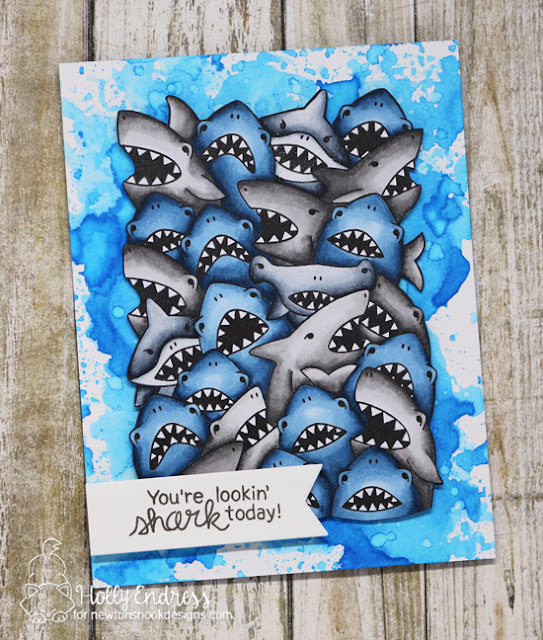 I created a Distress Ink background on a piece of watercolor paper and then I stamped and colored the shark image on a piece of X-Press It blending cardstock and colored it in with several shades of Blue and Grey copics. Then I trimmed the image out and adhered it to the background with some foam tape. I added some Clear Wink of Stella to parts of the image for a little pop of sparkle. I die cut a sentiment banner using the Frames and Flags die set and stamped the image in Grey ink. My next card features Flamingo Flock and I think it's my Favourite!! I created a Black card base and then I added a Pink scalloped rectangle using the Frames and Flags Die set. 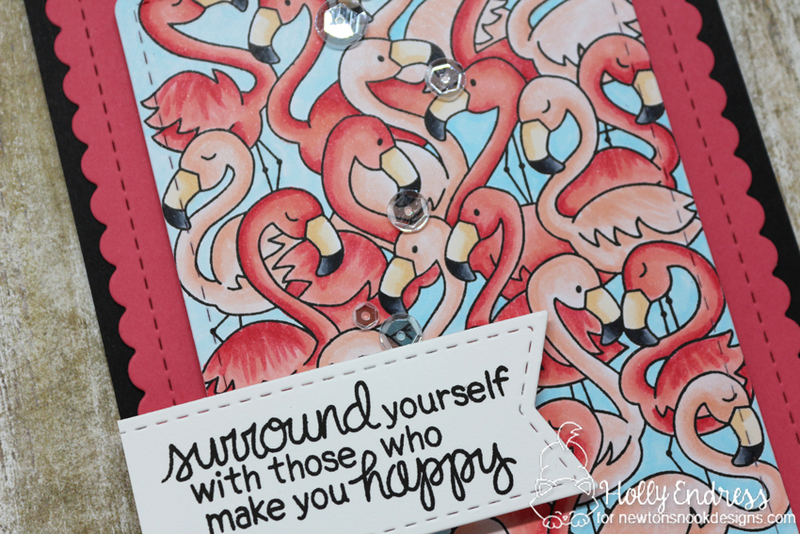 I stamped the Flamingos onto a piece of X-Press it blending cardstock and die cut the panel using the smaller rectangle from the same die set. Then I colored them in with Copics and adhered it to the panel with foam tape. I used the Frames and Flags die set for the sentiment strip as well. I wanted a little pop of sparkle on this one so I went with some mixed Sparkling Clear Sequins. This is such a cute set!! Which one is your favorite? Very cute - I am always amazed at your watercoloring techniques. Both card are so cute!!! Amazing shading on the sharks!!! awesome cards!! 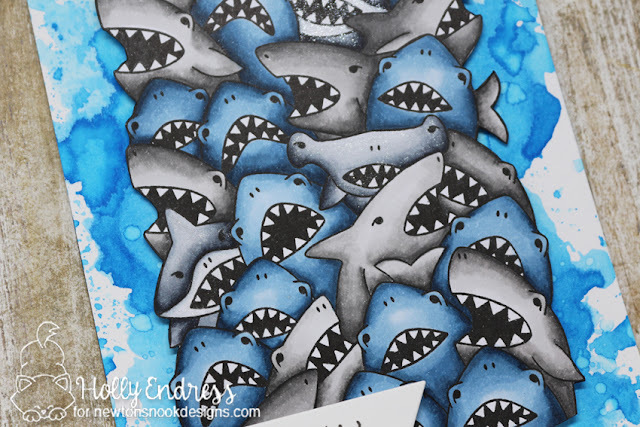 love the watercolor around the sharks! Gorgeous coloring of all these guys! Love them. These are both darling! 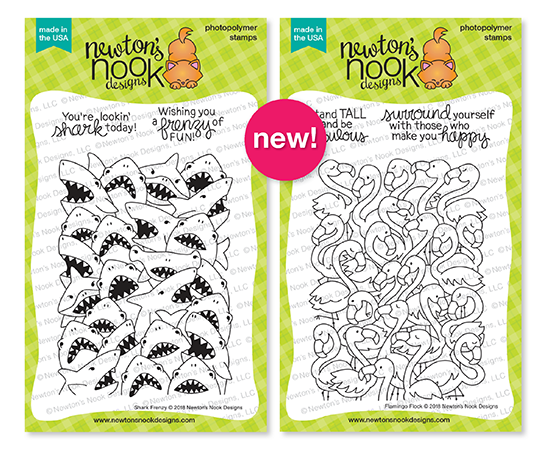 Your water colored background looks fabulous with the sharks! Such fun cards. Love the stamp sets. wonderfulc card..I especiallyl like how that school of sharks are bursting out of your watercoloured background. Great cards. I like the distress ink background on the shark card. Love these two sets, so fun and look awesome to color! Great background for the sharks and I love the scallop around the flamingoes! BEAUTIFUL cards! I especially LOVE the Flamingos one! I really like how you have a beautiful blue in the background behind the Flamingos it just really makes them stand out so nicely!! Awesome cards! :) Really love these new background stamps. Wow!! Your cards are so beautiful!!! 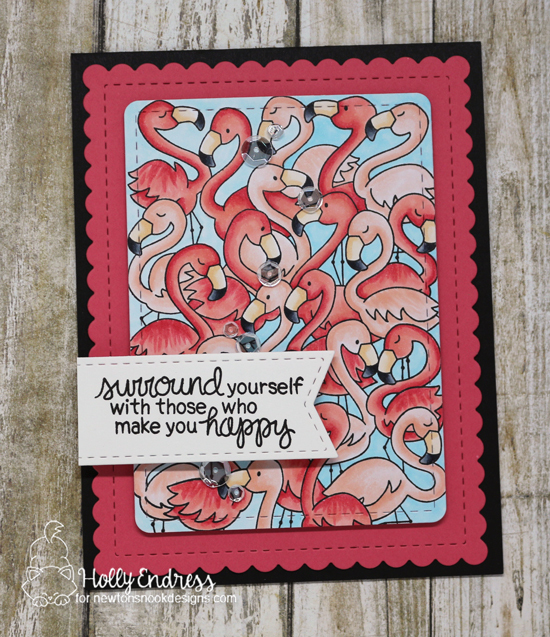 Love these colorful cards & the shades of blue on the sharks & pink on the flamingos! Such gorgeous coloring! These are fantastic! I love that sentiment! Wonderfully fun and beautiful cards! The watercolored background perfectly compliments the sharks and I love the blue and pink combo on the flamigo card. The water splatters are really cool on the shark card! I love it! Lovely coloring on your very fun cards! Your cards are beautiful ! I love how you "played" with two shades or colors. Gorgeous cards! Those sharks are kind of scary, love them! I'm really enjoying this release! Happy 5 years to Newton's Nook! I absolutely agree, the flamingos are just awesome !! Fantastic cards! I love your sharks! those stamps are so great!